Iraq’s government is in danger of falling to a radical militant group known as ISIS. Here are the key facts investors need to be aware of. ISIS, or The Islamic State in Iraq and the Levant, also known as ISIL, a militant group once deemed too violent and radical by al-Qaeda, is currently sweeping across both Iraq and Syria in an aggressive push to unify both nations into a single state. Both countries are falling fast -- Syria has been weakened by more than three years of civil war, and the new Iraqi government has failed to stabilize the fractured nation after U.S. troops left three years ago. Untrained and unmotivated Iraqi soldiers are surrendering without a fight, allowing advancing ISIS forces to take over Mosul, the second-largest city in Iraq, and large parts of eastern Syria while pushing south toward the borders of Baghdad. Iraqi Prime Minister Nouri al-Maliki has requested aid from the U.S., but President Obama has refused to grant it, stating that ISIS' advance should be a "wake up call" for the Iraqi leadership. Despite those strong words, the U.S. is still getting involved. President Obama has already deployed 275 troops to Baghdad for embassy security, and Secretary of State John Kerry has suggested an uneasy alliance with Iran to hold back ISIS' advance. In times of turmoil like these, investors should "hope for the best, but prepare for the worst." Let's take a closer look at what sectors and businesses will most likely be affected by the ISIS crisis. How much oil do Iraq and Syria produce? 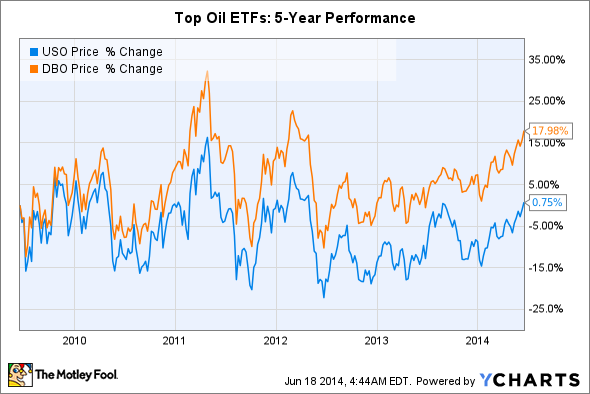 The biggest immediate concern is oil. Iraq is OPEC's second-largest producer of crude oil, pumping an average of 3.4 million barrels a day last month, and accounts for 3.7% of oil production worldwide. Meanwhile, Syria's oil reserves have been declining during the past several years, and were last recorded at 333,900 barrels per day in 2011. The Kirkuk-Baniyas crude oil pipeline once connected both countries, but it was damaged during the 2003 invasion of Iraq. In 2010, Iraq and Syria agreed to build two new Kirkuk-Baniyas pipelines -- one with a capacity of 1.5 million barrels per day in heavier crude, and another with a capacity of 1.25 million barrels per day in lighter crude. So far, oil prices have risen on concerns about the escalating crisis, but haven't spiked because roughly 90% of Iraq's oil is located in the south and in Kurdish-controlled areas, which have not been affected by the battles. Since Iran, which supports al-Maliki's government, borders Iraq's southern oil fields, it's unlikely that ISIS can directly disrupt the Iraqi oil supply. Source: Wikimedia Commons, author's edits. But in the event that ISIS wants to "liberate" the country from U.S. energy interests, Chevron (NYSE:CVX) would be the most well-protected, since it operates exclusively within the semi-autonomous Kurdish area. ExxonMobil and Occidental Petroleum could both lose oil fields. Oilfield service providers like Halliburton and Schlumberger would likely suffer the most. Investors who want exposure to rising oil prices without trading commodity contracts, or investing in individual companies, can consider ETFs, or exchange-traded funds, like United States Oil Fund (NYSEMKT:USO), which tracks the movements of West Texas Intermediate (WTI) light crude oil, or PowerShares DB Oil Fund (NYSEMKT:DBO), which tracks the value of future contracts on light crude. 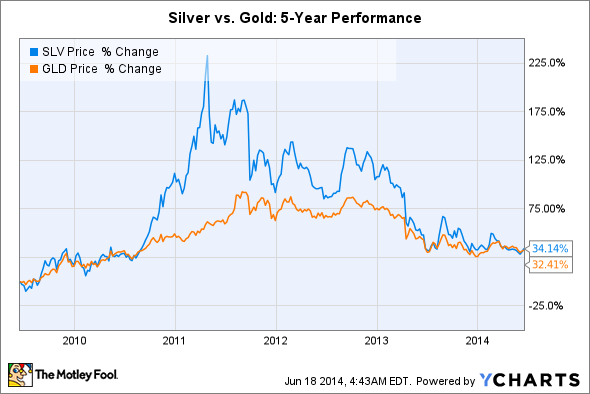 Are gold and silver now viable investments? In times of political uncertainty, gold and silver prices tend to rise for two reasons. First, both metals are perceived as safer than stocks and other investments. Second, higher oil prices often signal inflation, which, in turn strengthens gold. Silver generally follows gold, thanks to its dual role as both a precious and industrial metal. Gold prices have consistently declined since peaking at $1,890 per ounce in August 2011. The price has since declined 32%; but, at the same time, the S&P 500 has advanced 73%. Therefore, if the ISIS conflict escalates, and causes oil prices to rise and oil-dependent businesses to buckle under the pressure, gold and silver could be good ways to hedge your portfolio if the broader market comes under selling pressure. Just as with oil, a simple way to invest in both metals is through two ETFs -- SPDR Gold Trust (NYSEMKT:GLD) and iShares Silver Trust (NYSEMKT:SLV), which attempt to track the daily prices of the two metals. If oil prices rise and inflation kicks in, many businesses will take a hit on their bottom lines. Restaurants will report that the cost of raw materials has risen. Retailers will state that higher prices at the pump result in less disposable income. Rising oil prices will also affect the cost of plastic materials, PVC pipes, steel production, lumber, and asphalt -- which will drag down the construction industry. However, the airline industry could be hit the hardest of all. In 2008, when oil hit a historical high of $145 per barrel, seven U.S. airlines filed for bankruptcy. In the four years prior to that peak, six filed for bankruptcy, including Delta Airlines. The financial meltdown of 2008 and 2009 then wiped out many of the remaining players, including American Airlines in 2011. Only a few, such as Delta and American, were able to exit bankruptcy protection. Airlines have tried to keep history from repeating itself with tactics like fuel hedging (buying fuel at a fixed cost via a commodity swap or option), and buying more fuel-efficient aircraft, such as Boeing's Dreamliner. However, fuel hedges have backfired in the past, and the Dreamliner has only recently been cleared for takeoff after a series of widely publicized battery issues. Boeing's Dreamliner. Source: Wikimedia Commons. If oil prices surge from around $113 to a range between $150 to $200 per barrel -- as BP Capital Management's T. Boone Pickens recently warned on CNBC -- major airlines, like Delta Airlines, American Airlines, and United Continental, could struggle to remain profitable. In conclusion, investors need to pay attention to the crisis in Iraq, but they shouldn't overreact to the headlines. Oil could be headed higher, but $150+ per barrel projections are modeled on the worst-case scenario of the Iraqi government collapsing and shutting off its pumps. In the meantime, investors can consider a few conservative investments in oil, gold, and silver ETFs as hedges against the crisis.